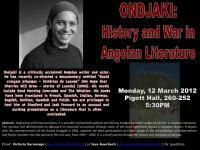 Ondjaki, the author of Biblioasis's second translation series title, Good Morning Comrades, is back in the U.S. this month on a tour of U.S. colleges and universities, and will be giving a talk at Stanford Monday March 12th, at 5:30 PM. Beginning with historical facts, it is possible to find both political and literary bridges between reality and fiction in Angolan literature. This seminar will demonstrate an approach to historical occurances through some of the most significant figures in Angolan history. It begins with the commencement of the Armed Struggle in 1961, explores the later participation of Cuban troops in the consolidation of independence and finally considers the last period of the civil war, from 1992 – 2002. It is a brief journey though the history and literature of Angola. For further information please go here. What gets imprinted upon a work of fiction when society is unraveling all around the writer? 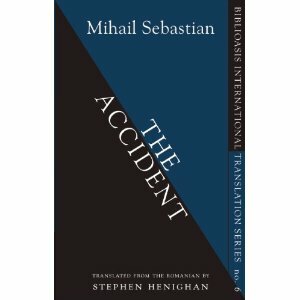 This is a question I grappled with while reading Mihail Sebastian’s fourth and last novel, The Accident, his first work of fiction to appear in English. Sebastian (1907-1945) first made waves in the English reading world when his Journal 1935-1944: The Fascist Years was translated in 2000. In that work, the novelist, playwright, and lawyer observed the literati around him growing increasingly right-wing as anti-Semitic legislation passed, legislation that (as Henighan helpfully explains in his Afterword toThe Accident) expelled him from the bar association and the Romanian Academy, and took away his right to publish. In The Accident, set in 1934 and originally published in 1940, Paul, a suicidal lawyer tries to forget Anna, a blond, blue-eyed waif of a painter. Instead, he meets Nora, a sturdy French teacher, after she falls off a tram – in a scene rendered with incredibly precise aural and tactile detail. Paul helps Nora, and despite his insufferable, depressed shrugs, their carefully-etched love story is off with a lurch. Nora convinces him to take a holiday to shake off his despair. They leave Bucharest to ski in Transylvania, except Paul has never skied before and Nora must teach him. There’s something transcendental to Paul’s hurtling through the blinding snow – he would be content to hurtle and continue a sensation of floating and brightness – but, irritatingly, Nora forces him to learn control. For the full review please go here. There is a new journal dedicated to translation studies our of Italy and Manchester. 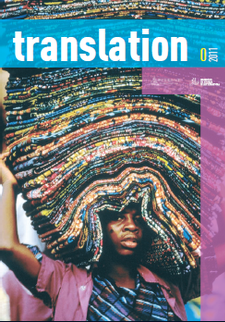 Translation: A Transdisciplinary Journal. For more information on this journal please visit here.